"Lucia Rijker vs. Christy Martin, July 30th. The biggest fight in the history of female boxing (Laila who?)." As a fight fan, I've watched the sport of female boxing grow. I can see an appreciation in the skills of these female combatants that are being featured more and more frequently on the undercards of their male counterparts' bouts. I find it entertaining as well as gratifying to see the women rise above the inexpert windmill style that pervaded their ranks in earlier days. It was too similar to the "Toughman" competition that I used to watch; more a spectacle than a sport. Now the level of ability has risen, and some legitimate stars have emerged. But this is 2005. 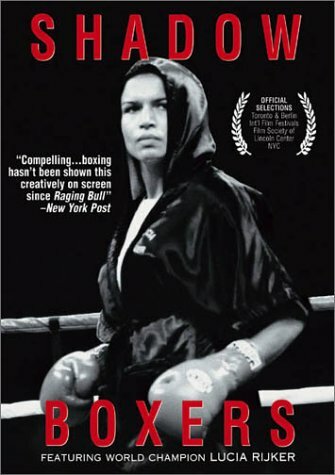 As the movie for this week's review, "Shadow Boxers", notes, the Golden Gloves tournament was opened up to women in 1995. So 10 years of amateur experienced fighters has made for more technically sound competition, as well as a growing number of legitimate female fighters. But one stands out today, just as she did in 1997 when the events of this documentary played out. And her name is Lucia Rijker. Back in 1997, the choices for whom or what aspects to make a female boxing documentary about were mighty slim. One name that jumps to my mind (and most others, I'm willing to bet) is Christy Martin. At the beginning of '97, Martin already had 33 professional fights to her name. She was already being touted as "The Face" of female boxing by Don King. Wearing pink trunks, nicknamed "The Coalminer's Daughter", her femininity was being showcased more than her (obviously) ample boxing skills. There was no need to do a documentary on Martin, as King and her husband/trainer/promoter Jim Martin were doing enough to get Christy's name out to the public. So Lucia Rijker was the only other obvious choice. While Rijker only had 3 professional fights under her belt at the beginning of 1997, she was a pretty safe bet for the filmmakers. Raised in Amsterdam, Rijker was involved in athletics her entire life. She made her mark as a champion kickboxer, so the transition to boxing wasn't completely unprecedented. Her obvious ability was recognized by trainer Freddie Roach, and she has made boxing her vocation ever since 1996 (with the occasional foray into motion pictures). The documentary begins by focusing (and rightly so) on the emergence of amateur fighting for women. With the aforementioned Golden Gloves tournament opening to women in 1995, a number of female fighters decided to try their stuff out in the ring. While this opening segment has a number of funny and heartfelt moments, it lingers a bit to long on one amateur competitor, lightweight Golden Gloves champ Jill “Flyin’ Lion” Matthews. Matthews walks the tightrope between being charismatic and just obnoxious, falling on the side of the latter more often than not. While her enthusiasm for the sport was obvious, it seemed like her enthusiasm for talking about herself was stronger. This portion of the film is short and the focus eventually shifts to Lucia Rijker. This transition from obvious amateurs to the very professional and visibly talented Rijker seemed odd to me. Rijker didn't come from the amateur ranks, so beginning with the focus on the Golden Glovers, while entertaining, didn't really fit. The obvious path would have been to make this into a completely separate documentary about amateur women boxers, with the option to follow individual fighters (besides the "Flyin' Lion") through the Golden Gloves Tournament. The remaining bulk of the film follows Rijker through training and a few professional fights. The footage of "The Dutch Destroyer" working out (at times sparring with men) and in more personal moments (stopping to see her mother before one of her fights in Amsterdam) are the most effective parts. Rijker is naturally charismatic (unlike some of her amateur counterparts) and rooting for her is easy. But the film does suffer during most of the interviews. After a perfunctory rehash of Rijker's childhood, the remaining interview footage has less to do with Rijker's views on "women in boxing" than what Rijker feels about the sport in general. And listening to her expound on the dangers of the sport is really preaching to the converted. If you watch boxing, you KNOW how dangerous the sport is, so having Rijker reiterate it is really pointless. As I mentioned earlier, the training footage is authentic and fantastic. Rijker is a one-of-a-kind athletic specimen, and her skills are evident. Her bond with trainer Freddie Roach is apparent, which brings me to a somewhat embarrassing confession. Despite the singular focus of Rijker and the purely professional conduct of Roach throughout, I (and my fiancé, who watched this with me) couldn't help thinking, "I wonder if Lucia and Freddie will end up together?" It's ridiculous because I've never watched Roach training, for example, Mike Tyson, and wondered if they were going to start dating. I'd like to point to the very physical, close-contact aspects of fight training as the cause for my romantic assumptions, rather than admitting to any Cro-Magnon views on male/female relationships. From now on I'll force myself to wonder if ALL fighters and trainers are "involved", just to mitigate any charges of sexism leveled against me. The fights themselves are presented well. Shown mostly in black and white, director Katya Bankowsky borrowed the setting title cards from Raging Bull, with "Rijker vs." whoever, the date, and the arena name and location shown before every fight. But the fights themselves are where things fall apart. There's a distinct difference in ability between Rijker and her opponents, leaving very little doubt as to the outcomes. And this robs the film of any of the innate drama that boxing presents. The entire draw of the "boxing-as-drama" genre is not knowing who wins. At this early stage (1997) in women's boxing, there was very little surprise when Lucia came out on top. There were a number of opportunities for this film to really shine. While the cinematic ability of Katya Bankowsky is evident, and the film is infused with the coolness of a hip-hop-heavy soundtrack (provided by DJ Zoël), I think the filmmakers missed out by splitting their focus between the emerging amateur ranks in 1997 and the talented Lucia Rijker. These should have been made into 2 separate documentaries. The chance to get a woman's perspective on the sport of boxing from the inside was also passed up for more general views on the sport. What was revealed during the interviews was nothing that hasn't been covered before in boxing documentaries. The saving grace is Lucia Rijker. Watching someone as intelligent and talented as Rijker was (and still is) entertaining enough. She has risen to the rank of "best female boxer in the world" since "Shadow Boxers" was made, and her upcoming match-up with Christy Martin (on Showtime, July 30th**) is something that I'll definitely watch. ** Update, July 25th, 2005 - Unfortunately, the Rijker/Martin fight has been postponed due to an Achilles tendon injury that Rijker suffered during training. Surgery was required, so the rescheduling is tentative, at best. Bummer.